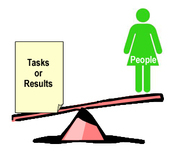 EQ4PM: Which is more important, People or Results? I read a post over at Joseph Liberti's blog, Emotional Intelligence at Work that got me thinking about the tension that many of us experience as leaders: do we focus more on people or on results? Joseph's post discusses the importance for leaders to be focused on BOTH people and results. When I started my career with IBM as a project engineer, I was focused only on results. I viewed people as distractions, time-wasters, or impediments to my ability to get my job done. I liked small projects where I didn't need to rely on others. I did not like bigger projects that required the support and cooperation of many people. I never appreciated the fact that small teams (and teams of one) rarely accomplish much. I am going to check out the book that Joseph referenced in his post, Extraordinary Leader: Turning Good Managers into Great Leaders. I am also going to bookmark Joseph's blog as it looks like he is bringing great insights about the application of emotional intelligence to the workplace.